Samsung promised at CES in January that it would deliver a 110-inch UHDTV this year to dwarf its already-gargantuan 85-inch model and with just a couple of days left to spare here it is. Apparently rolling out in China, the Middle East and a few European countries first, there's no word on price (the 85-inch had a $40K pricetag attached when it launched), but can you really put a price on a TV that's bigger than a king-size bed? That's right, at 2.6-meters by 1.8-meters there's more than enough room for well-heeled VIPs or employees of large companies and government agencies (the target market for the S9110) to catch some z's on it -- and bring a few friends. It's available for custom orders just before we see the new generation of Ultra HD (including a 105-inch curved model) at CES 2014 next week, although most of us will be looking for TVs that actually fit inside our living room. Who knew growing rice on a mountain could be so beautiful? 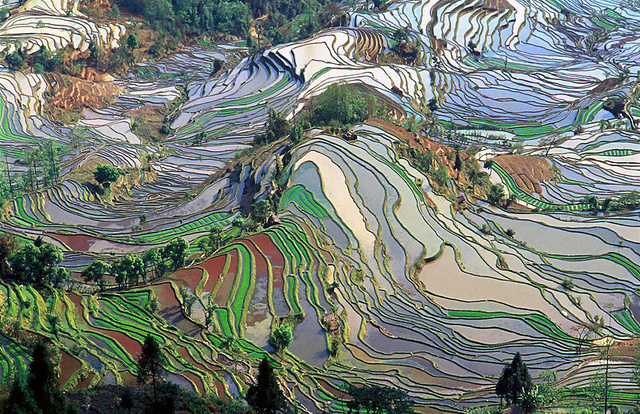 The Ailao Mountains in Yunnan, China, have been carved into thousands of gradual steps, each a paddy growing red rice. The rice terraces stretch out over some 400 square miles of mountains and valleys. A few things were missing from NVIDIA's Tegra Note 7 when it launched a month and a half ago, but the company promised that users would get a timely update that filled in some of the holes. That refresh, which includes Android 4.3 and a handful of other enhancements, is coming out to the $200 Tegra 4-powered tablet today. One of the biggest features that should've been offered from the very beginning is Always-on HDR (AOHDR), which does exactly what the feature's name implies -- make sure users can snap a real-time HDR shot without waiting several seconds for the camera to process it. There are a few other nice touches in the changelog, such as left-handed stylus support, improvements in the DirectStylus' response, notifications and the ability to transfer files to microSD from internal memory. Granted, this isn't the latest version of Android (4.4), but NVIDIA is planning on bringing it to the Note 7 eventually. In the meantime, at least users can enjoy the current update as it begins rolling out today around the world, regardless of which market you live in. While some of us are still recovering from holiday, the TCL folks in China -- whose products are better known under the Alcatel brand in many other countries -- have gone ahead and launched a new phone. As the name suggests, the Idol X+ is pretty much an updated version of the already impressive Idol X, with the highlight being it's the first device to carry the 2GHz bin of the octa-core MT6592 SoC (with 2GB RAM). TCL's reps told us that this is courtesy of an exclusive deal they arranged with MediaTek. Additionally, you'll find a familiar 5-inch 1080p IPS display within a slimmer 1.9mm bezel, plus a 13-megapixel f/2.0 camera on the back. Due to the larger 2,500mAh battery, the body is now slightly thicker at 7.9mm, but it's actually not that much different when we saw a prototype earlier. For a flagship Android phone that costs just CN¥1,999 or about US$330 unsubsidized, it's pretty bold of TCL to also include a Bluetooth activity plus sleep tracker. This Boom Band is essentially a little nugget that sits inside a plastic wristband (available in several colors), and it can double as a proximity alarm in case you accidentally leave your phone behind. It naturally has a companion app that lets you track your performance, and should you wish to, you can also show off your stats to friends. There's no word on whether non-China markets will get the same package branded by Alcatel, but if you already reside in China, you can head to JD.com and order one on January 15th. It's relatively easy to simulate life in an abstract sense, but it's tricky to do that cell-by-cell -- just ask the OpenWorm Project, which has spent months recreating a nematode in software. However, the team recently cleared an important milestone by getting its virtual worm to wiggle for the first time. The project now has an algorithm that triggers the same muscle contractions you'd see in the real organism, getting the 1,000-cell simulation to "swim" in a convincing fashion. There's still a long way to go before OpenWorm has a complete lifeform on its hands, mind you. The group has to introduce code for a nervous system, and performance is a problem -- it takes 72 hours to emulate one third of a second's worth of activity. If all goes well, though, you'll eventually get to play with the worm through a browser. In the meantime, you can check out the digital critter's motion in a video after the break. Google isn't about to remain idle while the Apple- and Microsoft-led "Rockstar" patent group sues numerous Android partners. The search giant has quietly filed a declaratory judgment complaint asking a San Jose court to rule that the company (and therefore, the Android ecosystem) doesn't infringe seven of Rockstar's patents. As GigaOM notes, Google isn't mincing words -- the firm accuses Rockstar of "placing a cloud" over Android and harassing a large part of the technology industry. The legal action doesn't necessarily amount to fighting fire with fire, though. Declaratory judgment complaints frequently represent attempts to score an early victory, rather than the first line of defense; Google likely has more up its sleeve if this tactic doesn't work. Chinese phone maker Gionee has just released the Elife E7 mini version of its mega-spec'd 5.5-inch, 1080p Elife E7 phone, but it resembles its larger sibling in name only. First off, the 13-megapizel camera and flash are on a swivel at the top, Oppo N1-style. The specifications are otherwise a step down, starting with the 4.7-inch, 720p screen and continuing with the 1.7GHz octa-core MediaTek MT6592 CPU (instead of a 2.5GHz Snapdragon 800) and 1GB of RAM in lieu of 3GB. It also sports 16GB of storage, dual-SIM 3G capability and Android 4.2. Still, the folks at FoneArena, who got their hands on one during its launch in India, said it feels just as premium as the Elife E7 and it looks to have skipped the fingerprint-prone glossy finish of that model. Though it likely won't arrive in the US, selfie self-portrait lovers in India will be able to grab it for 18,999 (about $310). For more pics, hit the source. The Aiguille du Midi, or Needle of the South, has been home to the terrifying highest vertical ascent cable car in the world for three decades. 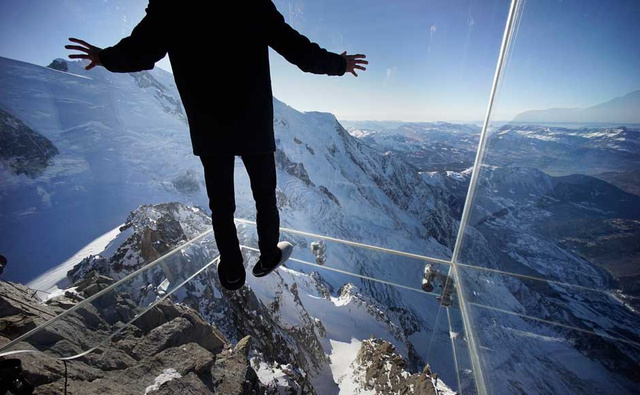 But this month, it's stepping up its scaring-the-wits-out-of-tourists game—with a glass box that hangs over the yawning void next to the peak. Samsung's 2014 smart TV lineup may revolve around impressive-looking hardware, but the Korean tech giant has revealed that interface improvements will also play an important role. Its new TVs will support finger gestures that should be more intuitive than the whole-hand commands of this year's models; you can stop a movie with a spinning motion, for instance. Voice control will also be more powerful. It's at last possible to change channels or launch apps with a single step, and search results appear in one place. While the gesture and voice upgrades may not be revolutions, they'll likely be welcome to viewers frustrated with unwieldy TV software.